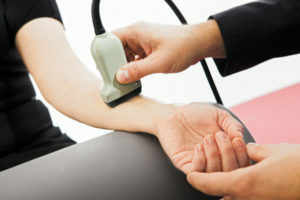 What happens during an EMG examination? Electromyography (also known as “needle EMG”) involves the measuring of electrical activity within muscles by way of a needle electrode. A small needle is inserted through the skin into a muscle belly (the needle electrode is by far smaller than the needle used for blood drawing). You can imagine it as having an electrical microphone at the tip of the needle. With this needle nothing will be injected, neither do I take any samples from your muscles, the needle just “listens” to your muscle. Muscles are electrically active organs, and the signals and patterns of signals can lend additional information regarding the state of the muscle as well as the nerve supplying it. The muscle’s electrical activity is then recorded while at rest and during movement. What is the objective of an EMG examination? Which information can be obtained by an EMG examination? Motor neurons transmit electrical signals that cause muscles to contract. Thus, muscle fibers and the nerve fibers that control them have to be regarded as a functional unit. EMG is a diagnostic procedure to assess muscles and the nerve cells that control them. Thus, EMG is useful for looking at both the nerve and the muscle or to determine, if your symptoms, including weakness, are caused by muscle or nerve damage. How severe is the degree of a nerve lesion? Is the nerve damage acute, subacute or chronic? If signs of acute and higher degree nerve damage are seen on EMG examination, this will, of course, have important implications for the therapeutic approach. Muscle weakness: myopathy or neuropathy? Muscle weakness can be caused either by a problem with the nerves that control the muscles or the muscles itself. EMG results can reveal nerve dysfunction, muscle dysfunction or problems with nerve-to-muscle signal transmission. Again, the therapeutic approach is totally different, depending on EMG findings. Are their signs of nerve regeneration? After a known nerve damage, EMG can show the regeneration process. If regeneration proceeds, then only patience may be needed. If regeneration processes are not seen on EMG, oftentimes there is a cause for this, that has to be searched for. This cause should be therapeutically targeted next, in order to restore the nerves capability to regenerate. The single most important question that can be answered using electrodiagnostic studies is, whether nerve fibers are merely irritated or whether nerve fibers are damaged. Using EMG, the degree of the nerve lesion and the acuity of the nerve damage can be studied. If nerve fibers are damaged, then there is a substantial risk of persisting neurological deficits. Furthermore, EMG is a very sensitive method and can detect changes in muscle fibers long before these changes are resulting in a reduction of muscle force. Thus, results of EMG testing is the most important criterion to decide, whether an operation is necessary or not. If EMG shows an acute damage of motor nerve fibers due to polyneuropathy, this is a warning sign. In this situation, further diagnostic procedures should be intensified, so that treatment can be started timely. EMG is probably the single most important examination to reach a diagnosis of myopathy. In the case of nerve injury, the degree of nerve lesions can be graduated based on electrodiagnostic testing (neurapraxia, axonotmesis, neurotmesis). Chances of spontaneous regeneration differ substantially between these different degrees of nerve lesions. This has implications for the planning of therapy. Using EMG it can also be demonstrated, whether regeneration processes have already started and how they proceed over time. Is an EMG examination painful? EMG involves using a very small needle. This needle is placed gently into specific muscle groups, depending on the problem that has to be investigated. The needle tests are a bit uncomfortable but usually quite tolerable as the needles used are very thin (similar to acupuncture needles). If there is anything that you feel is too uncomfortable let me know. Tests can often be done in a different way or can be stopped if you find them too uncomfortable. Please note: This is a different technique compared to so-called “Surface EMG”, where no needles are used. Indications for use and information gained by surface EMG vs needle EMG are quite different. On this webpage, I am talking primarily about needle EMG. Is an EMG examination dangerous? As with any procedure involving a needle (e.g. blood taking, vaccine, acupuncture) there is a small risk of damage to blood vessels (causing hemorrhage) and infection. Needle EMG may produce some minor bruising at the skin and muscle. Usually, this is of no consequence. Some people experience muscle soreness after the test at the site of the needles. None of these possible minor complications will last for long. If there is skin bruising, it should fade within several days. After the procedure is done, patients normally return home on the same day. You will be able to drive yourself home after the examination and return to work. Are there contraindications for EMG? Precautions need to be taken with patients who have hemophilia (a blood-clotting disorder that causes prolonged bleeding) or take strong blood-thinning medications (like Warfarin e.g.). What kind of medical training do doctors who perform NCS and EMGs have? Doctors who perform NCS and EMGs go to 6 years of medical school. In Germany, doctors performing NCS and EMG usually are neurologists. Board certification as a neurologist requires further 5-6 years training in a residency programme. In order to obtain a quality certificate of the german society of clinical neurophysiology (DGKN), a full-time training in NLG/EMG consisting of 6 months has to be performed (this can only be performed in a certified training site, where a minimum number of 750 patients per year are examined) and an examination has to be passed. To keep up to date in a very exciting and changing field of medicine, to maintain competence and learn about new and developing areas of their field, continuing medical education is necessary. What is sonography of nerves and muscles (neuromuscular ultrasound)? Sonography of nerves and muscles (also called neuromuscular ultrasound) is a new and emerging field of medicine. Recent advances in technology allow doctors to see even changes of small human nerves with ultrasound. This is oftentimes of great help for diagnosing and treating neuromuscular disorders.